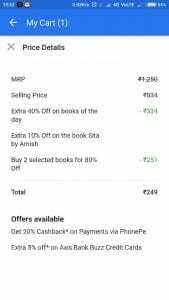 Flipkart Offering Flat 80% Off on selected books Additional you will get 20% cashback using phone pe so you will get a huge discount on books.Grab this offer before it get expired. Visit Offer Page From Here. Now Add any two books into cart .